Thursday was a big day for fans of Marvel's Netflix shows. Not only did the trailer for Luke Cage drop, giving us a first look at the series premiering in September, but so did the trailer for Iron Fist. 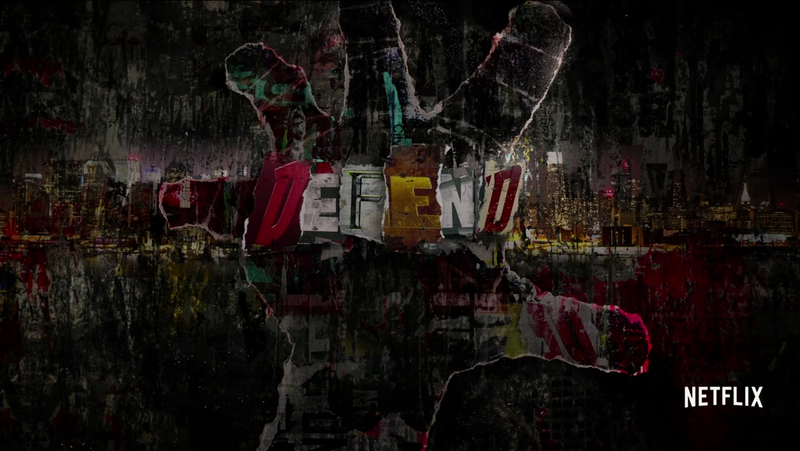 There was a trailer promoting Daredevil season 3, and then there was the icing on the cake: a teaser trailer for The Defenders, a series that will take Matt Murdock, Jessica Jones, Luke Cage, and Danny Rand and unite them into a giant, heroic mess. It's what the four Netflix shows are leading up to, sort of like a more R-rated version of The Avengers. Thanks to SDCC, we got sneak peeks at all of it yesterday, and it's almost too much to handle. As Anna (and Luke Cage before her) said, "Sweet Christmas." This trailer is simple and doesn't really contain anything interesting, but it still gave me major chills. I can't believe we've come this far and are so lucky to have received a Daredevil season three! I can still remember when my life wasn't consumed with this show and its beauty. Fun times. Ever since the end of Jessica Jones, I'm sure we've all been wondering what our favorite unbreakable man has been up to. This trailer certainly gives us an idea--his latest activities include breaking walls, punching people, and talking about Reva (</3). From what I can see, Luke Cage has a very similar feel to its predecessors, Daredevil and Jessica Jones. It's especially similar to the latter, which makes sense considering they exist in not only the same city but are more connected than any of the other Netflix shows thus far. (I'm definitely holding my breath for a Jessica appearance or two.) Because we've already had a taste of Luke Cage so far, I'm even more excited to see him helm his own show. September 2017, I'm definitely ready. Luke's bullet-riddled car door shield. Even more incredible. Luke Cage himself. He's incredible. It looks like Iron Fist is going to be another solid addition to the Netflix shows. I'm glad to see it also has its own feel. Danny Rand has an extensive and interesting comic backstory, so I look forward to seeing how they incorporate that in the show. I found a couple of interesting tidbits when researching him--Danny Rand has clashed with Luke Cage over being wealthy vs. poor respectively, and he also impersonated Daredevil for a time. So if the comics are any judge, Danny will definitely fit in well with our favorite Defenders. Everyone, I can barely contain my excitement for this show. Seriously. Like, I'm having trouble even forming my thoughts about this trailer into words. Simply put: it's amazing. I loved the voice over (which Jaime figured out is Stick from Daredevil). I especially loved the music choice, which was so poignant, and the visuals wowed me. Can it be 2017 already? What did you think of all four trailers? Which Netflix show are you most excited for?